No matter who you are or where you're from, you can't really feel nothing but sad and powerless when you see how one of the most well known buildings in the world burn. Let alone when said building isn't just a building but a piece of the human history and one of the most beautiful cathedrals in the world. 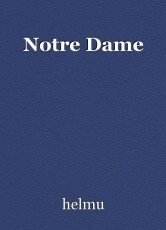 Norte Dame in Paris survived almost 900 years. It took nearly 200 years to build and the meaning of the place in French culture and history is indescribable. About 13 million people visit the cathedral yearly. Notre Dame has survived and witnessed both world wars, the French Revolution, the plague epidemics, the Medieval Paris and the Reneissance all the way to this day. It's heartwrenching to see such a big part of history and culture go up in flames. What's almost as sad as watching the pictures of the fire, is watching the pictures of the people. They're gathering and just watching the fire, singing together and then just being quiet. There's no panic, just sadness and you can literally see how helpless they feel. I can't imagine how the people of Paris feel, because I've never visited the place and even I feel bad. I've been in a fire at school and watching it burn down was hopeless but I can't compare it to this. If there is something positive, it's that no one seems to have been injured or killed. It seems the fire is an accident, but the loss is still enormous to the whole world. When you think about buildings that have survived this long and have had such an impact on people's lives, there aren't many. I hope they can save at least some of the place and my thoughts go out to the people of France. © Copyright 2019 helmu. All rights reserved. Well said. I have never been to the cathedral either but have know of it and marveled at the architecture. Such a tragic loss, yet the loss also brings us together. We share and find a glimmer of hope in the restoration. Icons of our humanity are necessary and this is one of those icons that needs to continue. Last count was over 1 billion dollars donated for the restoration. How many dollars have ever been donated to continue a war.